Not that I want to ruin anything for you, dear readers, but boy-howdy does know how to write a Danger Room scene. You get the feeling that this is actually happening and I can’t imagine how it would be for the New Mutants to be going through it. Magneto has pitted them against the Marauders this time, which probably could have happened if they weren’t jumping around through time and space. 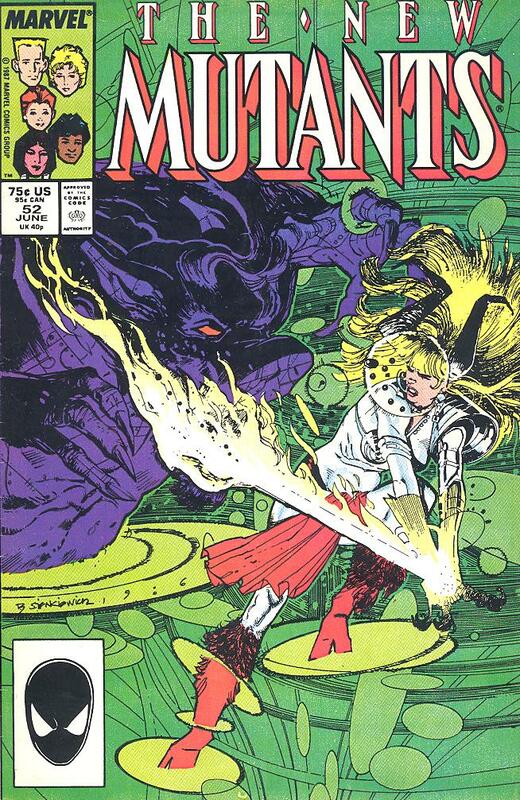 And speaking of, that leaves us with Magik. As the New Mutants are getting whooped while the Danger Room is wrapping up, Magneto is putting the kids on Front Street. When he finally figures out Magik is missing, it’s way past time. Our little “cuteling,” as known by her once-playmate S’ym, is giving the what-for to he and his cronies as they’re now her enemies. Magik is in full force here, as is Leonardi: there’s something about Claremont’s fantasy writing that really excels here. Just some glorious paneling and art here. Magik comes back a little worse for wear because the more she uses her power, the more it takes her over. Magneto searches her out, not to scold her, but to help. She takes him to Limbo where he has some power over the techno-organic beings that this world’s natives have become. With all his power, Magneto shows her what he could do to them…if only she’d let him.